You can’t deny that riding around on a Jet Ski is great fun, whether you’re a novice or a skilled rider showing off incredible acrobatic Jet Ski stunts. But zooming around at high speeds, doing jumps and sudden turns can get a bit repetitive. Thankfully, if you have your own Jet Ski, then there are plenty of things you can do, other than recreating SeaWorld stunt shows. Jet Ski can be the best choice for fishing! Jet Skis can prove to be very handy, quick and maneuverable fishing boats. From river and lake fishing to coastal and even deep sea fishing, all you need is the kind of equipment you’d take on a kayak and the open waters are all yours. You’ll be able to travel so much further than with a fishing kayak, all while still enjoying the solitude of spending a quiet day out on the water. We already know Jet Skis are fast and maneuverable, so it makes sense they’d be great for exploring. You can easily speed through uninteresting or built-up areas, slow down in the more scenic spots and stop for photos or a lunch break whenever you want. Because Jet Skis are licenced personal watercraft, you can use them through busier city waters such as the Brisbane River or even Sydney Harbour. All tourists walk around the city – be the one that explores the water. Speaking of tourism, there are plenty of tourist attractions out there where you can explore by Jet Ski. You can roam many islands of tropical areas like the Whitsundays, or even explore unusual waterways such as Canyon lakes. It’s important to always check first that Jet Skis are allowed in Marine Parks. Racing your Jet Ski out on the open seas can be fun, but it’s nowhere near as thrilling as zooming along with the trees on the banks shooting past and leaning into the bends of a windy river. Get some of your mates together and see who can make it down the river fastest. It’s a good idea to ride the river at least once before racing to you know the bends and that there aren’t any obstacles you could run into after a sharp turn. You don’t necessarily need a speedboat to go water skiing or wake-boarding. A powerful two to three seater Jet Ski will pull a single wake-boarder fairly easily. It won’t be quite as fast as a traditional motorboat, but unless you’re fanatical about water-skiing, it will do the job with plenty of fun to be had by all. In fact, there are plenty of advantages Jet Ski have over boats when it comes to water skiing. Jet Skis are cheaper to buy and operate than a boat or yacht. You can access restricted waterways that don’t allow boats but do allow smaller vessels. Some of the above mentioned restricted waterways will allow ramps and sliders. It’s easier to tow a Jet Ski with a car. Jet Skis can switch between salt and fresh water. So if you’re looking at buying a boat sometime soon, it might be worth considering the versatility of a Jet Ski. You may find you end up having more options than if you just went out and bought a conventional marine vessel. Need a loan for Jet Ski? 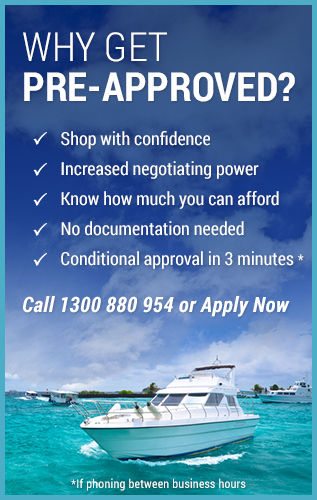 Talk to us at BoatLoans.com.au about marine finance for Jet Skis. We offer competitive finance on Jet Ski loans and can even offer marine insurance and extended warranty cover. Call us on 1300 880 954 or simply apply online to get things moving today. CAUTION: BoatLoans.com.au encourages safe boating. You should always obey relevant speed limits and restrictions defined by the area you are boating in.